When it comes to interior house decoration, walls are primary concern to many people. Are you aware that wallpaper is your ideal option and the most appealing item for decorating your house walls? Broken rocks wallpaper is among the best and most affordable wallpapers to drastically transform your walls in either your house or office. Wallpapers are important decoration products that can totally transform the appearance of your house or office. Broken rocks wallpaper is the best alternative for your house since it adds protective layer to the wall which is cleanable and washable. Unique wallpapers gives you the ability to really show off your personality and style with the range of patterns, designs and colors available. Looking for a shop where you can buy classy and durable wallpapers? 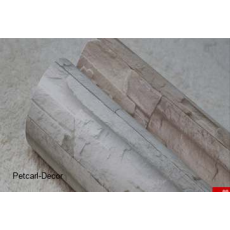 Visit Petcarl Décor shop today to buy classy and durable broken rocks wallpapers at affordable prices. You can also contact us to give you guidelines on how you can decorate the various rooms in your house using wallpapers.